NEXT PAGE - "True Science Agrees with the Bible"
Sovereign Publicatons, 92 Bromley Common, Bromley, Kent BR2 9PF, UK. Pay by PayPal - UK or overseas - click on the down arrow on the right of the price dropdown menu - select total book + P+P cost - click "Buy now" button. Alpha magazine - (Nick Mercer, London Bible College) "A tour de force covering all that material and much more. He has certainly risen to every challenge from both pro-evolutionists and anti-creationists. And yet has done this in language and with concepts accessible to the intelligent non-scientist." Dr. A.J. Monty White "..no sooner is one salvo of scientific facts fired against an evolutionary view..than another salvo of yet more scientific data is launched with deadly accuracy against another dearly held evolutionary belief. 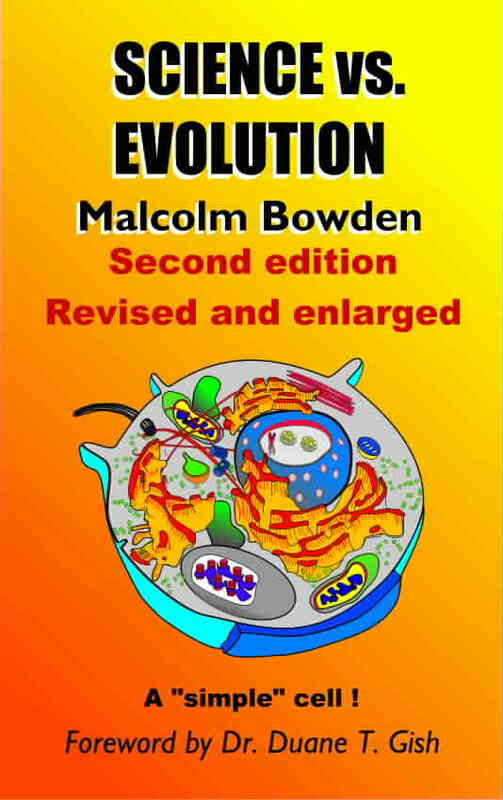 One is left wondering how any self-respecting scientist could possibly believe in evolution after reading this book." "A wonderful book. Very clearly written. Provides an excellent overview of issues in Geology, Biology and Physics. Formidable argumentation. One point I'm not sure about, though - the assertion Archaeopteryx must be a fake. Perhaps it is, but I think its worth cross-referencing Bowden's view with that of Answers-in-Genesis on their website, just to be aware its a disputed point. But Bowden might be right, he presents a strong case. I highly recommend this book. It presents strong arguments very clearly and incisively, and covers a lot of ground. I think its probably most useful for people looking for an introductory overview of some of the key issues in the fields mentioned; certainly I found it to be a very great help indeed when I initially came to consider some of these points; it gave me a firm grasp of a number of the issues involved. But I think it also stands beyond merely being an introduction to these points; I would say as a whole it stands as something of an eloquent treatise on the dubious character of Evolutionist argumentation generally. This is because of Bowden's skills a writer, as a communicator, and his knowledgeable, incisive and lucid arguments covering such a range of points. And the book also remains very useful as something of an index of starting off points. For an overview, there is a lot of information packed in here. 1) Are they fossilised cells? G. Discordant evidence - and the "Establishment"
The unending sequence of "missing link" discoveries! A. Chemical production of "life"
.. Richard Dawkins' "The Blind Watchmaker"
"The elephant in the living room"
(2) A new origin for geological strata ? - (A) "Survival of the fittest"
- (B) "Nature red in tooth and claw"
- (C) "Dog eat dog"
APPENDIX 1 - Archaeopteryx - is it a fake? That the experiments were "shoddy" now accepted! Dawkin's "tricks of the advocate's trade"
Forster and Marsden's "Reason, Science and Faith"
1 Geological Conformity and Unconformity. 2 How the Geological Column has been compiled. 5 Some strange animals in the Cambrian strata. 6 Archaeopteryx - the Berlin specimen. 7 The flight feathers of a bird. 8 The "evolution" of the Horse. 1 The half life of radioactive elements. 3 Carbon 14 decay - the reduction of the datings. 4 Cosmic ray deflection by the earth抯 magnetic field.